The planetary influences are associated with the chakras by rotating the zodiac such that the signs of Capricorn and Aquarius are aligned with the 1st chakra as shown above (see the 7 Chakras). When viewing this alignment, the archetypal planetary ruler of each sign can be assigned to a chakra position as indicated in the diagram. To clarify the symbology of the diagram shown above, let's focus on the 2 rows of symbols at the top and the 2 rows of symbols at the bottom of the diagram. The outer of these rows of symbols represent the planetary ruler assigned with the associated astrological sign (the inner row of symbols). You will notice that the 7th chakra does not have a set of zodiacal signs associated with it. This is indicative of the fact that the 7th chakra is transcendental in nature, and as such does not manifest as form. Instead, it shows that the 7th chakra is represented by the 2 lights (Sun and Moon) as reflected by the 3 outer planets of Uranus, Neptune and Pluto. These 3 planets act outside of the ancient set of the 7-planet system of our solar system, being the Sun and Moon (the 2 lights) and the planets Mercury, Venus, Mars, Jupiter and Saturn. Saturn still maintains the position of outer ruler of this solar system, making the 3 outer planets members of a larger galactic system. As such, these outer planets represent the connection of our higher faculties to the cosmos in general. As the signs are assigned with their associated chakra, you will notice a color-coding in effect. Take the 1st chakra signs of Capricorn and Aquarius: The background color for Aquarius is yellow, while that of Capricorn is blue. This signifies that Aquarius is dominant in the day, whereas Capricorn is dominant at night. This is in reference to the original statements regarding sign placements described by Agrippa and others--being Saturn rules Aquarius by day and Capricorn by night. 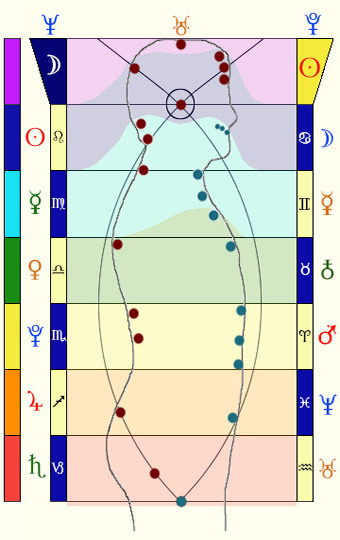 Later we come to find that Uranus is now associated with Aquarius, but that does not change the relationship any. Uranus rules Aquarius by day and Saturn rules Capricorn by night. By following the color-coding as we move to the succeeding chakras, it is noticed that they alternate between being dominant by day, and then by night. This shows that the traditional placement of the signs already had this alternating sequence present in its structure. Seeing it as it is shown above, it becomes apparent that the alternating sequence creates the effect of spiraling around a central pole, as is representative of the intertwining snakes, the components of the caduceus (see The Caduceus Symbol).